As part of an initiative to drive American libraries and scholarly institutions towards sharing data more openly, the Library of Congress has embarked on a Bibliographic Framework Plan. This plan will encourage libraries as well as the Library of Congress itself to slowly transition from MARC records towards RDA and Linked Open Data. Since 2009, the Library of Congress has been exposing its famous vocabulary and its Authority Names into Linked Open Data through the Library of Congress Linked Open Data Service portal. The goals of the Library of Congress Linked Open Data Service are twofold, benefiting both the Library of Congress and human and machine users. Benefits for the Library of Congress include, the ability to establish provenance for the loc.gov domain on the Semantic Web, fewer taxing downloads from their website related to users retrieving single records at a time and finally the ability to share best practices and encourage other institutions to format their data as Linked Open Data. The benefits for human and computer users are also significant and include bulk download of entire controlled vocabulary datasets, ability to link to Library of congress data values within their own metadata via Linked Data, access to powerful datasets for no cost, concept and value relationship mapping and a host of other developer specific services. The Library of Congress Authorities and Subject Headings are used throughout the world to resolve name variants and to aid in cataloging and research. Since the 1800’s The Library of Congress has been held as a trusted authority and presently the Library is continuing this legacy by coining authoritative and reliable URIs based on its existing vocabularies and authorities. Due to the large scale of this project and the incredible amount of data to be formatted, the Library of Congress will be releasing linked data versions of different Library of Congress Classification classes as they are finished. The Linked Data program launched with the release of the B (Philosophy, Psychology, and Religion), M (Music), N (Fine Arts), and Z (Bibliography, Library Science, and Information Resources). By visiting the Library of Congress Linked Data Service website, users can query any of the available datasets as well as any combination of the datasets simultaneously. The Linked Data Service search tool, works similarly to the traditional Authorities portal, but includes more information as well as an updated look and simplified results pages. Searching under a related name (ex. “Lady Day” for Billie Holiday) users are brought directly to the authority file where popular Library of Congress information can be found as well as the file’s URI and links to alternative formats and exact matching concepts from other schemes. 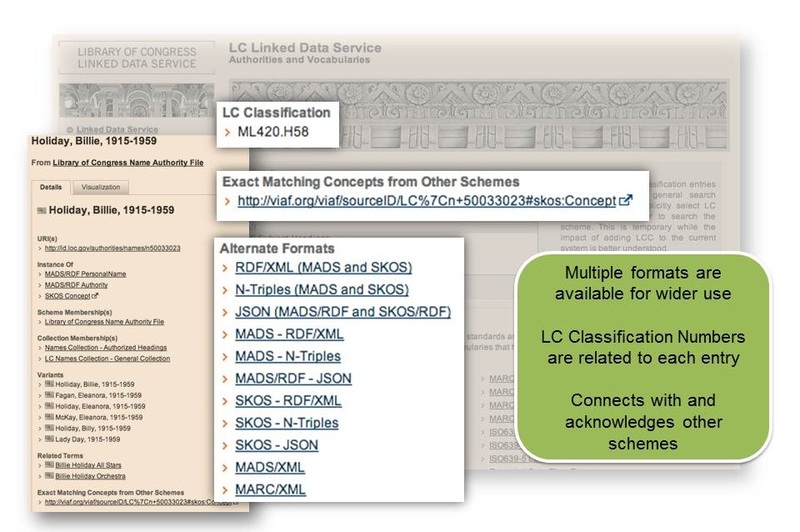 The power of the Linked Data Services search portal and the Authority and Vocabulary file pages is the elegant connections each file forms between well known Library of Congress services such as LC Classification and source links, to Linked Open Data and through Linked Open Data to other schemes and thereby other reputable institutions. Currently, The Library of Congress currently provides 17 downloadable datasets for the public to download. The datasets are formatted in RDF/XML, Turtle or N-Triples, additionally each download also contains MADS/RDF and SKOS/RDF representations of the data. APIs are not available through the Library of Congress. The Library provides instruction, explanation and definitions through their Technical Center. The Technical center walks users through how to download and utilize the bulk dataset downloads and also includes a brief walk through command-line downloads. The Technical Center also helps to promote the Library’s focus on education and the dissemination of Linked Open Data, through explanatory pages devoted to Metadata, Searching/Querying and Serializations. The teaching and promotion efforts are also extended to a wider audience through blogposts from throughout the Library of Congress website that point to the Linked Data Services webpage.